The Fringe Attack: Yay or Nay? 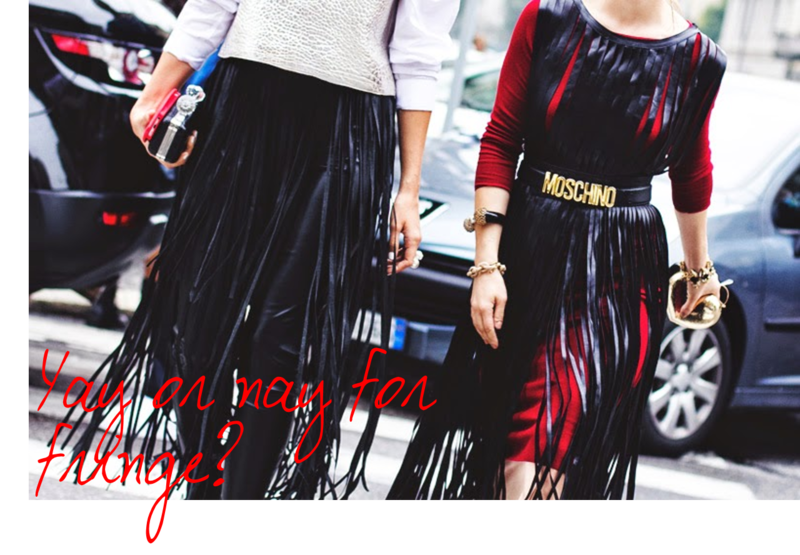 When you google ‘street style fringe’ or simply just ‘fringe trend’, the amount of gorgeously fringed outfits that pop up are enough to make anyone love the trend. BUT here’s my problem; once it hit the high-street the quality and quantity of fringe is laughable compared to the runway. I want real thick fringe, not little tassel-like thin fringe. Now I know one of you are screaming “well what do you expect, it’s the high-street”, but for a trend that I don’t believe will make a huge comeback for A/W16, (I may be wrong) is investing your money in that fairly cute River Island fringe biker jacket a great idea? On the other hand, the trend is one of the biggest taken from this seasons Fashion Week runway, with fringe seen hanging off hemlines of skirts, jumpers and heels. But even more importantly; the trend was rocked by many of the best street stylers for Fashion Week, with one of my style icon’s even joining in on the fun (Olivia Palermo). Zara open-work fringed top; £25, Warehouse fringed suede jacket; £120, H&M fringed skirt; £24.99, ALDO white across bag with fringe detail; £35, Zara fringed high heel sandals; £49.99. So, now its your turn. I want to hear what you think.